After months of speculation, LeBron James made his decision on where he will play. On July 1st, Klutch Sports reported James agreed to a four year, $154 million contract with the Los Angeles Lakers. Since James' signing, other players such as Lance Stephenson, Rajon Rondo, and JaVale McGee have signed to the Lakers as well. The news shook the entire world. It seems that the Showtime Lakers are returning to form. 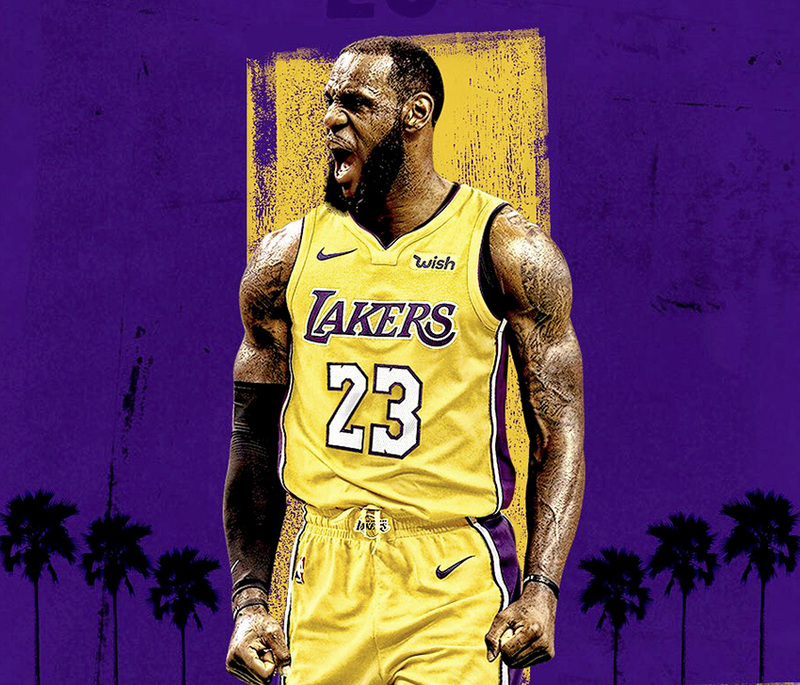 Everyone is excited to see how far a LeBron-led Lakers team can go. The biggest question is: can James win a championship in Los Angeles? Does signing James puts the Lakers in the title picture? Lets examine this unprecedented signing. James will be surrounded with more talented players than he had with the Cleveland Cavaliers. The Lakers' young core of Kyle Kuzma, Brandon Ingram and Lonzo Ball look to improve their games more now that they will be playing with James. Also, the Lakers' bench is much better. Their bench will include the before-mentioned Stephenson, Rondo and McGee. James now has enough scoring power and solid bench plays behind him to help with trimming his minutes, giving him much-needed rest. By James signing with the Lakers, that gives the franchise even greater chances to land another star player. Reports are swirling that NBA All-Stars Kawhi Leonard and DeMarcus Cousins are very interested in playing for the Lakers. Both Leonard and Cousins could very well become Lakers next year, if not this year. James has dominated the Eastern Conference for 15 years. James has won the Eastern Conference Championship 9 times with the Cavaliers and the Miami Heat. Playing in the Western Conference, which has stiffer competition, will keep James motivated and have him play at an even higher level. James has the chance to become the first player in NBA history to win a NBA title in both conferences. Also, bringing a champion to the Lakers, who have not won a title since 2010, will cement his legacy as being the greatest player in NBA history. Although James will be playing with very talented players, they are still not ready as a whole. It will up to James to train the much younger Kuzma, Ingram and Ball to handle the white hot spotlight that has been placed on them. The young guys will face tough criticism with playing with James, which can become draining and overbearing. Also, the newly-formed Lakers will need to learn how to play together. James is a ball-dominate player. Rondo and Ball are the point guards who are great at passing. Ingram and Kuzma are gifted scorers. It will be interesting in how Head Coach Luke Walton will draw up plays and keep players happy, especially Rondo, who can be temperamental and stubborn. It will take a while for everyone to become cohesive. James signing with the Lakers do not make the Lakers a complete team. The Lakers still have some needs to fill and moves to make. If they want to acquire another superstar for the long term, they will have to unload Luol Deng's contract to free up cap space. Deng is still owed $36 million over the next two years. Deng has produced very little during his time in Los Angeles. Also, the Lakers still need shooters who can hit threes consistently and good defensive players. James is now a player in the Western Conference, which is much tougher than the East. Not only the West is the home of the defending champions, the Golden State Warriors, but James will have to play teams like the Houston Rockets, San Antonio Spurs and the Oklahoma City Thunder. Also, teams such as the Minnesota Timberwolves, the Utah Jazz, the Portland TrailBlazers, and the Denver Nuggets are good with young talents. Even the teams who missed the playoffs last year are improving. It will be very difficult for James to make it out of the West in order to play in the NBA Finals. This was a great move by James. He chose the best place for him to build a championship team. It will be exciting to see James in a Lakers uniform. He's been captivating his entire career. It will be interesting to see how he does in the West, where teams have to fight every game to stay in the playoff picture. The Lakers' aurora is glowing brighter under Magic Johnson, who is the President of Basketball Operations. The Lakers will return to the playoffs for the first time in five years. However, they are not ready to win a championship just yet. There is still work to be done. Fans will have to be patient. Signing James was just a huge first step.